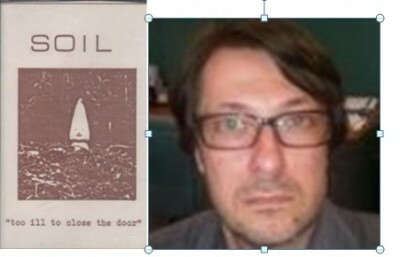 Cover of my mate Matthew Karras's bands tape EP; "Too ill to close the door". He was lead singer of Soil back in the 80's. As bands go they were too clever, too funny and didn't dance or take drugs so when the "Madchester" scene came along they didn't get any success. Still miss their first album (tape only) "Too ill to close the door". The name came from an encounter with some bombed out hippy who wouldn't shut the door to their rehersal room because he was "too ill". The Cover was a photo of a washed out squeeky carrot that had gone white and so looked like a parsnip on top of the guitarist Kevs compost heap. Parsnips were handed out at gigs in celebration. It included a cover of the Soft Machines "Why are we sleeping?" Other tracks were self penned; Front room, You'll never gues who it was it was my dad and What does this do?Matt sometimes plays with a band called Glassglue.